Gila Kis Se Karein is a drama was telecast in 2015 on Express entertainment every Thursday at 08:00 pm. The drama is directed by Irfan Aslam. Gila Kis Se Karein is presented by Abdullah Kadwani and Asad Qureshi. The drama is starring many famous actors in lead roles such as Uroosa Qureshi, Asim Mehmood, Asad Siddiqui, Aiman Khan, Farah Nadeem, Benita David, Erum Azam and others. Gila Kis Se Karein is a family entertainment drama. 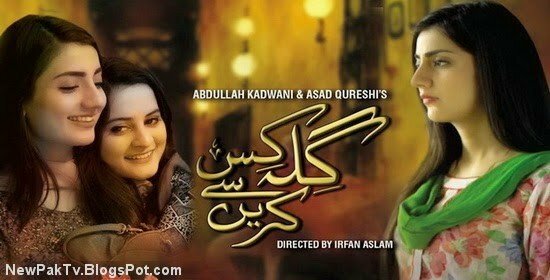 If you are looking for Gila Kis Se Karein drama actors names, timings, on-air days, photos, and OST title song then you can find these here. You can also find the public opinion and reviews about Gila Kis Se Karein drama here.